Richard Fitzhugh was born in D.C. in 1944 and graduated from Howard University's School of Architecture in 1968. 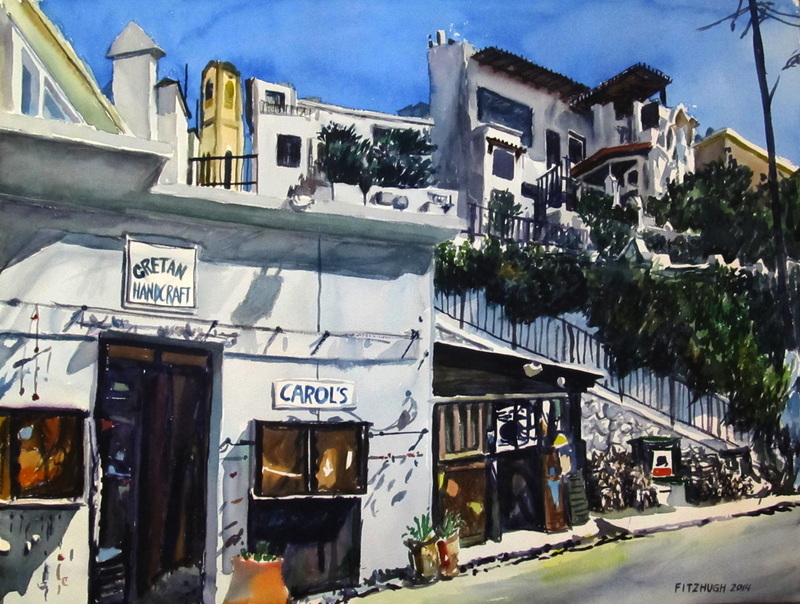 He has done architectural renderings since 1971, and watercolor paintings since 1984, and believes they are both still fun. ​“Capturing life’s complexity in my paintings infuses energy in my work and has led me to explore different mediums including watercolor, ink, charcoal, and most recently sharpies. “I wanted to capture the warm sunny day, while we shopped at Carol’s jewelry store. We were in the town of Myrthios on the Southern coast of Crete, near Plakias. “I work with watercolor because this paint medium is transparent. With transparency, every paint stroke-- past and present-- is visible to the naked eye. Being able to see everything gives a painting a depth and vibrancy that capture the layers of what life is about! That’s what watercolor means to me.